The US holds Venezuelan President Nicolás Maduro "personally responsible" for the safety of two seized opposition leaders, President Donald Trump has warned. In a statement, Mr Trump also called for the immediate and unconditional release of all political prisoners. Leopoldo López and Antonio Ledezma, who had been under house arrest, were taken to a military prison on Tuesday. This came after Sunday's controversial vote for a constitutional assembly. At least 10 people were killed, as the opposition boycotted the election. President Maduro said the poll was a "vote for the revolution", arguing that the move would create peace and foster dialogue by bringing together different sectors of Venezuela's polarised society. The opposition said late on Tuesday that it had decided to hold a demonstration against the new assembly on Thursday. Opposition lawmaker Freddy Guevara tweeted (in Spanish) the rally would be held on "the day the dictatorship plans to install the fraudulent assembly". It had originally been thought that the government would open the constituent assembly on Wednesday, thereby evicting the opposition-controlled National Assembly. Venezuelan Defence Minister Vladimir Padrino López said the army "reiterates its unconditional support to the president"
In his statement, President Trump said the US condemned the actions of the "Maduro dictatorship". The two opposition leaders were "political prisoners being held illegally by the regime", he added. "The United States holds Maduro - who publicly announced just hours earlier that he would move against his political opposition - personally responsible for the health and safety of Mr López, Mr Ledezma and any others seized." Is Maduro on a power grab? What lies ahead for divided Venezuela? Earlier, Secretary of State Rex Tillerson described the re-arrest of the two opposition leaders as "very alarming". 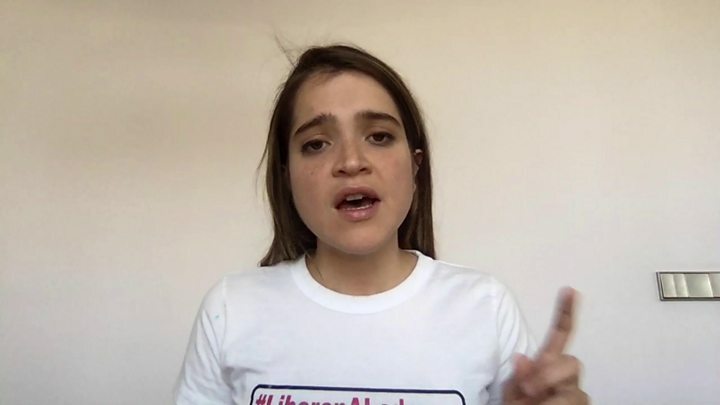 Media captionAntonietta Ledezma: "My father knew the risks"
"The situation from a humanitarian standpoint is already becoming dire," he said. "We are evaluating all of our policy options as to what can we do to create a change of conditions, where either Maduro decides he doesn't have a future and wants to leave of his own accord, or we can return the government processes back to their constitution." US Treasury Secretary Steven Mnuchin announced on Monday that the US had imposed sanctions on President Maduro. Mr López was taken from his home at 12:27 local time (04:27GMT) on Tuesday, his wife, Lilian Tintori, wrote on Twitter. A video posted showed him being taken away by members of the Venezuelan intelligence service, Sebin. 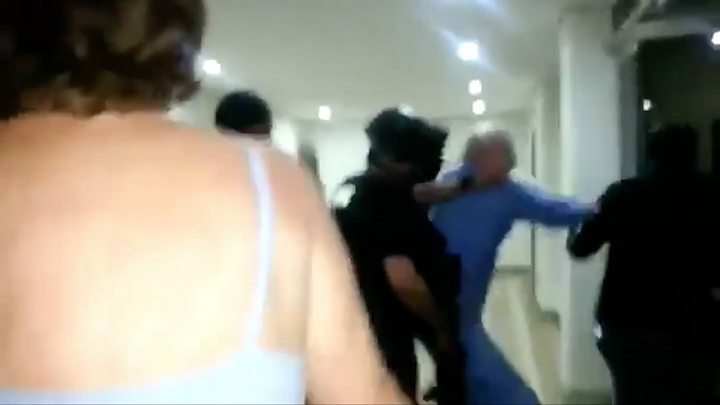 The daughter of Mr Ledezma, Vanessa Ledezma, also posted a video of her father, wearing pyjamas, being taken away by the Sebin. A woman can be heard shouting "They're taking Ledezma, they're taking Ledezma, dictatorship!" The two opposition leaders were taken to Ramo Verde military prison. The Supreme Court, which critics say is dominated by government loyalists, said it had received intelligence reports alleging the two were trying to flee. The court also said that it had revoked Mr Ledezma's and Mr López's house arrest because they had made political statements. Both Mr Ledezma and Mr López were key figures in the wave of protests which swept through Venezuela in 2014 in which 43 people from both sides of the political divide were killed. They have played a less prominent role in the most recent protests because they have been under house arrest but their video messages still get reported and shared widely on opposition websites. Released from military prison and put under house arrest on 8 July 2017 for "health reasons"
Published a video on YouTube on 31 July calling the election for a constituent assembly a "fraud"